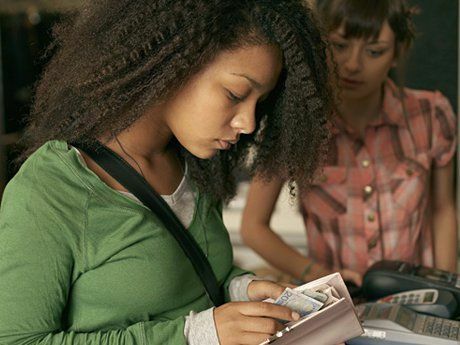 Most high school students are making financial choices now. Many shop, have jobs, pay bills, are eligible for tax refunds if they file, have accounts at financial institutions, make car payments, pay car insurance -- and most importantly, college-bound students are preparing to make a student debt choice. Financial literacy lessons help these kids grapple with the adult choices they already face as teenagers. Following are three lesson principles I apply when preparing my financial literacy lessons. I try to prepare for my class by seeing the financial world through the eyes of a teenager. Shopping for prom, saving for a car and choosing a mobile phone service are teenage priorities. These priorities are opportunities to teach concepts such as goal-setting, comparison-shopping techniques, saving strategies, behavioral finance strategies and the power of compound interest. One of my favorite lessons is teaching my students how to use their mobile phones to make better financial decisions and to manage their own money. I do not get tied down with teaching rote-memory facts or the financial tools of yesterday. I focus on introducing the students to financial concepts that are applicable throughout their lives, and apply them to the scenarios they are facing today and will face in the years ahead. Every child is different, and students with disabilities require a different approach. My semester course for special education and special needs students was designed collaboratively with Michael Roush of the National Disability Institute and Chris Shannon, thanks to a grant from Discover. The course is still a work in progress. My aim is to see marked improvement in what my students have learned. A greater quest is motivating them to put what they're learning into action. I want to grow their appreciation for the financial tools that are available to them and can improve their lives. For example, I want them to have a positive view toward opening a savings account. Nearly a third of American families rely on costly fringe banking services, so I want to help break that cycle by showing the advantages of opening a savings account at an NCUA-insured credit union or FDIC-insured bank. I like to take advantage of student desires such as attending prom or buying a used car by giving them tools to reach their own goals through saving. The site is full of resources to save toward specific goals and practical cost-cutting tips. My favorite tool will send students nudging text messages that encourage them to save toward their own savings goal. Students have a tough time wrapping their minds around the true cost of owning a car. After they comparison shop for affordable used cars, I have them use the True Cost to Own calculator to determine what the car will cost after factoring in additional expenses such as gas, taxes, depreciation and interest. Eventually, I have the students use articles and resources on the Ohio Insurance Institute website to fully understand the cost of car insurance. This quiz makes it easier for me to put the students at the center of the course, empowering them with tools and concepts that are in line with their own goals and values. For example, I have them use their own quiz results as a compass for future goal-setting activities. CFPB's "Paying for College": From start to finish, this resource from the Consumer Financial Protection Bureau can help students make informed financial decisions about paying for college. LifeDojo (Financial Skills 101): A blended learning program that provides turnkey lessons for students and teachers. PlaySpent: A simulation that gives students the opportunity to experience living in poverty. Money as You Learn: Texts, lessons and tasks that connect the Common Core to real life applications while also equipping students with the knowledge to make smart financial decisions. The U.S. President's Advisory Council on Financial Capability developed this site. OnGuardOnline.gov: The federal government's website to help students be safe, secure and responsible online. The site includes games, video and digital content. I especially like this resource to help students with special needs. Hands on Banking: A program that includes curriculum for teachers and online modules for students and people of all ages (detailed more fully in this blog series' post about middle school). The Spanish language option is an excellent way to reach ESL students. What are your favorite financial literacy resources?